Japanese Episode DP 184: "The Third Round of the Shin'ou League! Shinji vs. Jun!!" American Episode 1327: "Casting a Paul on Barry!" Now that the second round of the Suzuran Conference is over, the line-up for the third round is announced. Shinji and Jun are scheduled to face each other while Satoshi will be going up against Kouhei. 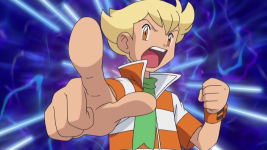 During their research into their opponents, the trainers discover that the name of the challenger who won the first two rounds using only a Darkrai is Takuto. Later, the third round match between Shinji and Jun begins. Jun sends out Airmd, so Shinji chooses Booburn. Jun rushes to have Airmd cover the field in caltrops before Booburn is able to knock it out with a powerful Flamethrower attack. Jun's second pokemon is Empärt. Shinji ignores the effects of Caltrop and switches out his Booburn with his Ringuma, so Jun decides to go with Sawamura. Jun's pokemon is quick and able to get in a few good hits, but the burn Ringuma suffers from one of Sawamura's Blaze Kicks activates its Guts ability and gives it enough of a power boost to defeat Sawamura. Jun is down to his last pokemon, while Shinji still has all three left! Jun's Empärt comes close to knocking out Ringuma, so Shinji switches it out with his Elekibull. The electric type pokemon's attacks weaken Empärt enough to activate its Raging Rapids ability, but even that is not enough to overpower Shinji's pokemon. Jun ends up losing the match, allowing Shinji to move on to the next round. As the third round of the Suzuran Conference continues, Satoshi wonders what tricks Kouhei has in store for him. I'm sure you've figured this out about me by now, but I'm not a fan of rivals who are just used as punching bags. What's the point of setting up a character as a "rival" if they never pose any threat to anyone, ever? This episode, unfortunately, cements Jun's role as someone who isn't really a rival. Now I wouldn't have wanted Jun to beat Shinji, of course. But seriously, writers, you could have at least had him take down one of Shinji's pokemon. Would that have been too much to ask? Jun's track record for this show is abysmal - he's had a grand total of one on-screen win, ever - and he really didn't deserve to be curb stomped like this. I remember watching this episode for the first time and waiting for Shinji's Ringuma to succumb to the barrage of attacks his Sawamura was unleashing, but it never did. It just took all its hits, even though it was weak to every one of the many attacks Sawamura dished out. So, so disappointing. As is often the case with these league episodes, I found little to complain about with the non-battle parts of the episode. I really like seeing the trainers research each other and really do the work necessary to win and finding out more about Takuto. But the highlight for me came when Hikari did her imitations of Shinji. I usually find Hikari to be mildly entertaining at best, so seeing her do something genuinely funny like put on a Shinji voice and mock the way he talks was a nice surprise indeed. And then there's Kouhei, who just makes everything better. The dub has its good script days and its bad script days, and this episode falls into the latter category. I really wonder why some scripts turn out better than others. Did Jimmy Zoppi just have a bad day or something? And also, why couldn't they keep more than four damn pieces of music in the whole thing? I guess what I'm saying is, why can't the dub just be better? My "job" would be too easy if TPCI simply translated everything accurately, wouldn't it? This one takes place right after Barry bumps into Dawn. Ash: "Barry, where are you going in such a hurry?" Barry: "To go see Paul." Barry: "Right! Because no matter how you look at it, Paul and I are the top two contenders in the tournament. And now, the top two seeds are going to battle head to head! It gets lonely at the top, but Paul's there to keep me company." In the original, Jun compares the match between him and Shinji as being bigger than the Big Bang. I guess that was too controversial for TPCI or something, so the reference got edited out. Next, more Team Rocket merchandise! Jessie: "Delectable Pokémon rice crackers and bean buns!" Meowth: "And an adorable Meowth dolly with every order." Like the previous episode, the "Pokémon rice crackers" and "(Pokémon) bean buns" were originally pokemon senbei and pokemon manjuu, respectively. The "Meowth doll(y)" was a Maneki Nyaasu (招きニャース), or "Beckoning Nyasu." It's basically the same as a maneki neko, the good luck charm on which Nyasu is modeled after. Barry: "I've researched everything on him, but it's all outdated. There's not one thing that's current. So if Paul were to use a Pokémon that's not found in the database..."
Barry: "I didn't say that." 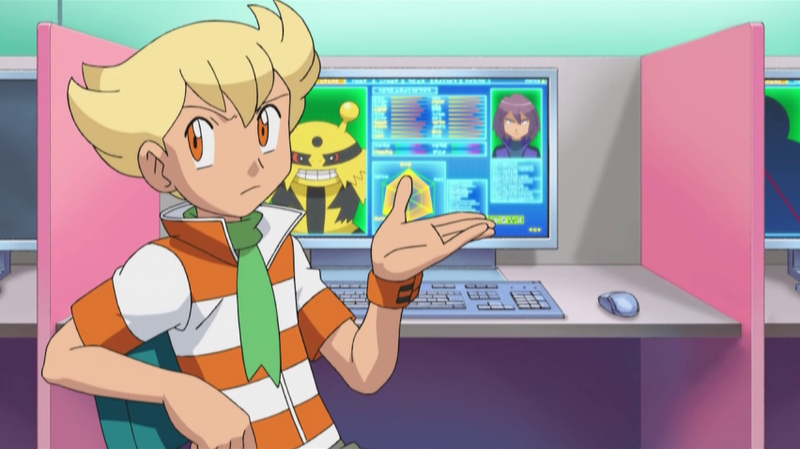 I find it kind of amusing that Barry would go on about how "outdated" the data is while an image of Paul's Electivire is being displayed on the screen behind him. I mean really, Barry, how much more up-to-date do you need it to be? Originally, Jun states that data of the past is just that; data of the past. Nothing more, nothing less. He goes on to say that he can study records of old battles all he wants but that all the preparation in the world won't help him if Shinji chooses a pokemon he hasn't used before. Barry: "I give up. No sense in making myself nuts." Ash: "Now that's the spirit! Just go for it!" Barry: "You're right! Just go for it!" Dawn: "Like you're going for broke!" In another case of the animation not matching what's being said, we see Dawn close her eyes and sweatdrop as she encourages Ash and Barry. Originally, both Jun and Satoshi use the phrase atatte kudakeyo da (当たって砕けよだ), a proverb that's the equivalent of the English language "nothing ventured, nothing gained" or "go for broke." So after the two boys talk about going for broke, Hikari chimes in and says that the "broke" part of their proclamation sounds kind of bad. Kind of like a "Really, guys? Broke is as high as you're aiming?" Pokédex: "Skarmory, the armor bird Pokémon. Skarmory's body is covered with a steel like armor and can fly at speeds of over 100 miles per hour." The speed given to us in the Japanese version is 300 km per hour, which is approximately 186 mph. The Pokédex in the English versions of the games rounds this down to 180 mph, but this episode cuts that same speed nearly in half. Brock: "Fire-type moves are super effective against steel types, and this proves it." Ash: "Skarmory's out in one move!" Takeshi is surprised that while yes, fire-type attacks are strong against steel-type attacks, Booburn must be really strong to be able to defeat Airmd in one hit. Brock doesn't really seem surprised at Magmortar's strength the way Takeshi is surprised at Booburn's. Barry: "Thanks Skarmory, you were great. I know fire-types are weak against water-types. So alright then, Empoleon, let's get going!" Jun thanks Airmd and adds that it fulfilled its role perfectly. He's basically telling us that he knew his pokemon was going to lose and that it was only meant to set a trap, not knock out Shinji's pokemon. We don't get this in the dub at all. Brock: "Usaring's Ability is Guts. So when its status has been affected, like with Burn or Poison, its attack power grows!" The status ailments Takeshi lists in the Japanese version are paralysis and poison, not burn and poison. Meowth: "Yeah, it's a party in the stadium while out here you can hear paint dry." ....we see a Murkrow fly past. Maybe you're wondering why? What's happening here is a common trope in Japanese cartoons. A character says something stupid or really obvious, like "it's more exciting in there than it is out here," and a crow will fly by to signify the character's stupidity. Basically, crows (or, in this case, crow-like pokemon) = stupid. Announcer: "Whoa! That couldn't have been fun!" Whoa! What's with the announcer's new-found casual speaking style? Originally, he just says the attack is super effective. Jessie: "Hungry? Electivire bars to celebrate sweet victory! What else? How about this? Empoleon intertubes!" Meowth: "Miniature Ursaring, carved out of cool wood and even cooler crash resistant Hitmonlee helmets!" The only real change here are the "Electivire bars," which were Erekiburu no kaminari okoshi (エレキブルの雷おこし), or "Elekibull Thunder Okoshi." The Japanese Wikipedia has a picture of okoshi, which are these bars made out of rice and millet. The rest of their merchandise is the same in both versions. James: "We'll sell until we're tchotchkes free!" Jessie, James, and Meowth: "With big bonuses for you and me!" I know Meowth has said "oy vey" before (and that's only the most recent example! ), but I believe this may be the first time we've heard James utter a Yiddish expression. Are the ten year olds to who this show is aimed supposed to know what tchotchkes are? And when will Jessie get a Yiddish phrase of her own? Anyway, the line that the Rocket-Dan members say in unison at the end there is that they're doing everything for Sakaki-sama's sake. Jessie, James, and Meowth, on the other hand, are considerably more selfish. Narrator: "And so, what of Conway's secret strategy? And what will Ash's strategy be for winning the third round of the Sinnoh League tournament? Stay tuned for all the answers!" "What will be Ash's strategy for winning the third round of the Sinnoh League tournament?" Well gee, thanks for the spoiler, Mr. Narrator! The Japanese narrator just asks if Satoshi will be able to win his next match. I also love that the narrator of this show still uses the anachronistic phrase "stay tuned." Nothing says "hip" and "modern" like telling them not to fiddle with the rabbit ears sitting on the top of their TVs!